Once upon a time, a venerable and well-known automaker, realizing the end was nigh, tried desperately to show the public that while they might be down, they were not yet out. They called on the world’s most famous designer and asked him to design them a sports car: something so striking and unusual that buyers would come running back to dealerships just to see it and thus breathe life into a dying business. It failed, but the designer’s sports car rose from the ashes and went on to outlive its parent company by more than 40 years. This is the story of the Studebaker Avanti. 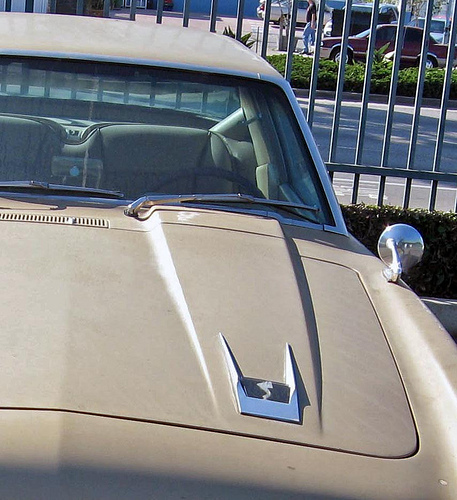 In 1961, when the Avanti was conceived, Studebaker was already more than 100 years old. Founded in 1852 in South Bend, Indiana, by Henry and Clement Studebaker, the company spent its first 50 years building horse-drawn wagons and carriages. In 1902, Henry and Clement’s younger brother John decided to enter the automobile business, concentrating initially on electric cars. Studebaker boomed before World War I and during the 1920s, nearly collapsed with the onset of the Great Depression, and recovered soundly under new management in the mid-thirties. 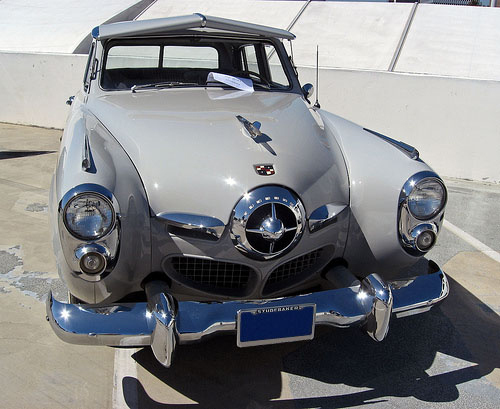 Studebaker was the first American manufacturer to offer a genuinely all-new car in the booming postwar years and reached its peak in 1950 with nearly half a billion dollars in sales. By 1954, Studebaker was in trouble. Like other American independents (Kaiser-Frazer, Nash, Hudson, and Packard, inter alia), Studebaker was at a serious disadvantage against the “Big Three”: General Motors, Ford, and Chrysler. Not only were the major automakers rolling out new technology like V8 engines, power steering, and air conditioning, rapid styling changes quickly made new cars look outdated. In the face of this competition, exacerbated by a brutal price war between Chevrolet and Ford, Studebaker found itself struggling to keep up. The venerable independent had its own V8 and automatic, but antiquated production facilities and low sales volume — only 80,000 units for 1954, about 200,000 units below the company’s break-even point — made for high unit costs and eventually substantial losses. In the fall of 1954, Studebaker merged with the Packard Motor Car Company, an independent luxury marque whose products had once been the most prestigious in America. Packard and Studebaker had both been struggling in a difficult market and both felt a merger would shore up their struggling business, allowing them to increase their overall volume and dealer base. Unfortunately, even Studebaker apparently didn’t realize the depths of its financial predicament and the merger nearly sank both companies. In 1956, Studebaker-Packard signed a management agreement with the aircraft manufacturer Curtiss-Wright, which provided a desperately needed infusion of cash at the cost of Studebaker-Packard’s defense business, Packard’s engine and transmission plant, and the subsequent demise of Packard as an independent concern. 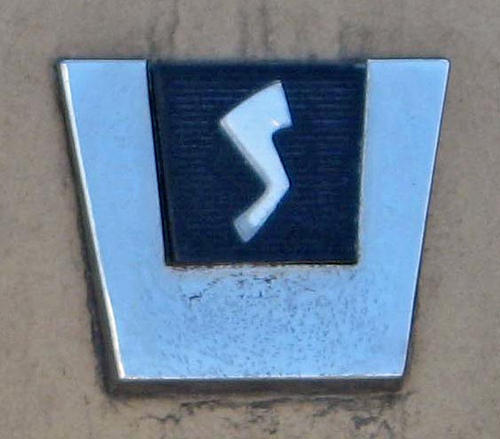 Raymond Loewy’s group designed Studebaker’s “lazy-S” emblem. It was updated in the 1950s with a more angular look. Although the Packard marque died in 1958, Studebaker earned a brief reprieve in the wake of the 1957–1958 Eisenhower Recession. Seeing the country’s newfound infatuation with compact economy cars, Studebaker president Harold Churchill reinvented the existing Studebaker sedan as the compact Lark. It proved to be a hit, allowing the company to post a $28.5 million profit after years of losses. Recognizing that the loss of its military contracts had left the company dangerously vulnerable to the fluctuations of a notoriously fickle auto market, the Studebaker-Packard board decided to invest most of those profits into an ambitious diversification plan. In short order, the company bought up a variety of non-automotive businesses, including Chemical Compounds (later renamed STP, after one of the company’s most successful products), a forklift manufacturer, and the Gravely Tractors company. The board’s doubts about Studebaker’s future in the auto industry were cemented by the introduction for 1960 of the Big Three’s own compact cars, which cut sharply into demand for the Lark and sent profits plummeting to less than $1 million. Churchill, who had fought hard for more money to bolster the car line, was forced out and replaced in early 1961 by Sherwood Egbert, a hotshot 41-year-old former Marine who had previously resuscitated the McCulloch chainsaw company. Studebaker’s survival as an automaker in the late fifties and early sixties hinged on the compact Lark, a cleverly foreshortened version of the company’s 1953-vintage sedan body concocted by chief engineer Eugene Hardig. The Studebaker-Packard board had no reason to assume that Egbert, who arrived at Studebaker in February 1961, would be a ‘car guy.’ However, Egbert had been involved with McCulloch’s Paxton Engineering subsidiary (sold in 1958 to hot-rodding impresario Andy Granatelli), which made automotive superchargers, and that brief taste had apparently whetted his appetite. Egbert didn’t know much about cars or automobile manufacturing, but he became an excited and enthusiastic booster of the company’s automotive business — certainly not what the board had expected or had in mind. Egbert quickly decided that the surest way to revive public interest in Studebaker’s cars was to build something new and flashy that would draw people back to showrooms. He wanted a Studebaker sports car. We don’t know if Egbert took this idea to Studebaker chief stylist Randy Faurot and chief engineer Gene Hardig, but if he did, they would likely have told him that the earliest such a car could be ready would be the 1964 model year — possibly later, if Egbert wanted anything really new or elaborate. Egbert had more ambitious ideas: He wanted his new sports car ready to introduce at the 1962 New York International Auto Show, then only 13 months away. An insistence on nigh-impossible deadlines would be a defining characteristic of Egbert’s entire Studebaker tenure; this may have been the first example, but it was definitely not the last. Hardig tried repeatedly to explain the normal lead times involved in automotive development and production, but Egbert either didn’t believe him or didn’t care. To some extent, the urgency was probably just a reflection of Egbert’s temperament, but it wasn’t wholly arbitrary. He was well aware of how precarious Studebaker’s automotive operations were — not least with the Studebaker-Packard board — and he understood that if anything took too long, there was a good chance it would never happen at all. In early March, Egbert decided to go out of house to design the new sports car. He even had a designer in mind; he picked up the phone and called Raymond Loewy. Raymond Loewy was perhaps the most famous designer of his era. Born in France in 1893, he had moved to America as a young man and, after a stint as a window designer for major New York department stores in the 1920s, became an industrial designer. Over the next three decades, he brought a clean, Art Moderne flair to products like refrigerators, locomotives, the modern Coca-Cola bottle, and an array of familiar logos and packaging that ranged from Hoover Vacuum Cleaners to Lucky Strike cigarettes and Shell Gasoline. He made the cover of TIME in 1949 and it would be fair to say that most Americans saw or interacted with at least one Loewy-designed product every day. In 1936, Studebaker president Paul Hoffman had hired Loewy to design the company’s 1938 line. Raymond Loewy Associates (RLA) remained involved with Studebaker until 1955, with Loewy’s satellite office in South Bend acting as Studebaker’s primary styling department. RLA produced a variety of memorable models, including the dramatic 1947 Champion (actually designed behind Loewy’s back by Loewy associate Virgil Exner, subsequently hired by Studebaker and later Chrysler), the 1950 “Next Look” Commander, and the 1953 Starliner and Starlight coupes. Among the Studebakers designed by Raymond Loewy Associates were the aircraft-influenced, “bullet-nose” 1950–1951 models. This is a 1950 Studebaker Land Cruiser sedan. Although Loewy’s contract with Studebaker had ended more than five years earlier, Egbert knew Loewy personally, having met him while on vacation in Palm Springs. In a meeting in South Bend on March 9, Egbert laid out his ideas. He and Loewy found that they were of a similar mind about what needed to be done, and in any case, few designers would turn down the opportunity to create an all-new sports car. The timetable would be a very tall order — Egbert wanted the finished design within 40 days — but Loewy agreed to take it as a challenge. Loewy insisted that the design not be created in South Bend; with time so short, the last thing he wanted was to have Studebaker designers and engineers looking over his shoulder. Egbert, who wanted the project to remain top secret until it was complete, readily agreed. A week and a half later, Loewy rented a house in Palm Springs to serve as a workshop and brought in three of his staff: designer Bob Andrews, a Loewy veteran who had worked on the 1953 Studebaker Starlight and Starliner (and before that the 1948–1954 Step-Down Hudsons); John Ebstein, Loewy’s vice president, who would serve as project director; and a young designer named Tom Kellogg, whom Loewy had just hired a few days earlier. Until they arrived in Palm Springs, the trio were not told what they would be working on and Loewy sequestered them in the rented house like a jury in a high-profile criminal trial, forbidding them to so much as call their wives. Although Loewy had been publicly credited with the styling of past Studebakers, his hands-on involvement with automotive design work had always been limited. Like GM’s Harley Earl and Bill Mitchell, Loewy’s principal role was to direct, inspire, and manage the designers doing the actual work and then pitch their concepts to management. He was an excellent promoter, but some of his employees, like Virgil Exner, had been irritated by what they saw as a propensity for claiming credit for the work of others. 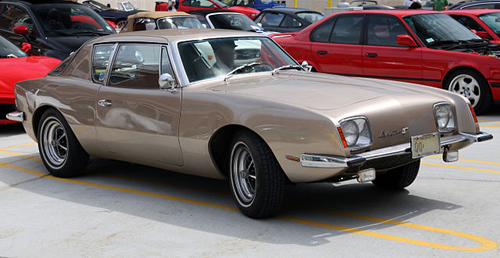 Unlike previous “Loewy” Studebakers, however, the Avanti was very much Loewy’s design. Although he did relatively little of the actual design work, the aesthetic and principles were Loewy’s own, taking their cues from several custom-bodied cars he had had built for his own use in the fifties. This is a 1963 Studebaker Avanti, distinguishable by the shape of the headlamps. 1964 Avantis (and the Avanti II) still had round headlights, but the bezels were now rectangular, giving a slightly less wide-eyed look to the nose. The grille under the bumper also changed in detail. The “knife-blade” fenders, inspired by the contemporary Lincoln Continental were controversial, as was the absence of a prominent radiator grille, something Loewy insisted on forgoing. The smooth nose was at least aerodynamically sound, reducing drag. (Most modern front-engine cars are “bumper breathers,” taking their intake and cooling air from the high-pressure area under the front bumper; big grilles today are primarily cosmetic.) This car has the R2 supercharged engine, rated at 290 gross horsepower (216 kW), linked to the three-speed Borg-Warner Power-Shift automatic. Loewy and Egbert had agreed that the new car should have a sleek, aerodynamic form like that of the new E-type Jaguar, eschewing the abundant chrome and useless gimmickry that had festooned the American cars of the late fifties. (That was just as well, considering Egbert’s timetable; aesthetics aside, we can’t imagine there would have been time to tool for a lot of complex trim and Egbert would probably have balked at the added expense.) With that in mind, Loewy envisioned a low-slung, long-hood/short-deck semi-fastback coupe with a grilleless nose and a wasp-waisted curvature to the rear fenders, suggesting a supersonic aircraft. It would have crisp but not rigid lines — he insisted the car have no straight lines at all — and complex compound curves. Andrews, Kellogg, and Ebstein refined these ideas in a little over a week of frantic effort, producing an assortment of drawings and a 1/8th-scale clay model. On April 2, Loewy showed the model to Egbert, who made approving noises, and then had the designers pack up their work and fly to South Bend to oversee the development of a full-size model. The first full-size clay, further refined by Studebaker designer Bob Doehler, was ready for Egbert to present to the board on April 27 and was quickly approved for production. 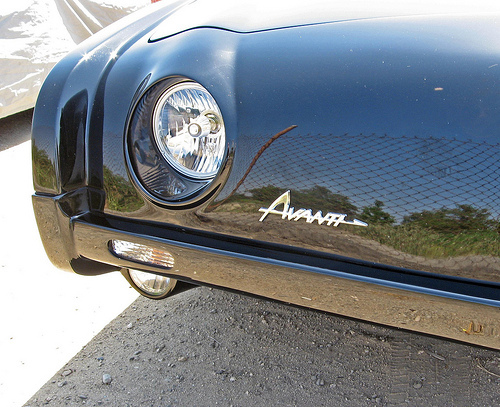 Studebaker’s ad agency provided the name: Avanti, meaning “Forward” in Italian. In an ideal world, the Avanti might have presented a great opportunity to introduce a new chassis of more modern design than Studebaker’s existing platform, which dated back to the early fifties. 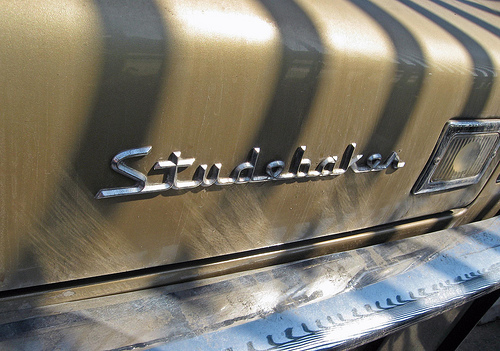 Unfortunately, even if Studebaker had had the money for that, there was no time. Instead, the Avanti would use a specially modified Studebaker Lark convertible frame. The Avanti’s complex shape would have been both challenging and prohibitively expensive to build in steel. Instead, Studebaker turned to the Molded Fiber Glass Body Company (MFG), which made the bodies for the Chevrolet Corvette, to mold the Avanti’s exterior panels of glass-reinforced plastic, more commonly known as fiberglass. Fiberglass had become popular for commercial use in the late thirties and by the 1950s, it briefly appeared to be the Next Big Thing in automotive manufacturing. 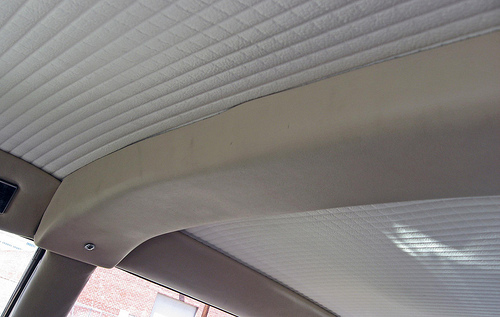 Fiberglass is light, inexpensive, and can be formed into shapes difficult to achieve with stamped steel. The bigger attraction for automakers, particularly small or underfunded ones, is that plastic molds are far less expensive than the dies and presses required for steel panels, making fiberglass significantly more economical than steel for low- or limited-production models. The drawbacks of fiberglass, which ultimately kept it from making a bigger impact on the automotive mainstream than it did, include a lack of rigidity (which must be compensated by a stiffer and heavier frame, largely canceling any potential weight savings) and the difficulty of getting paint to adhere to plastic bodies without excessive ‘crazing’ due to body panel flexing. Maintaining a consistently high standard of manufacturing and assembly quality can also be difficult. Indeed, the early Avanti bodies were beset with quality control problems, eventually forcing Studebaker to bring assembly in-house rather than continuing to allow MFG to assemble the body shells. Even then, fit and finish often left much to be desired. Beneath this cover is the Studebaker Avanti’s integral roll bar. Some critics doubted its efficacy, but it remains an unusual and commendable feature for a production car. The Studebaker Avanti certainly looked swoopy, but Egbert (and Loewy) did not want it to be just a pretty face, insisting on world-class performance not only in terms of straight-line speed and acceleration, but also in handling, braking, and safety. To the latter end, the Avanti incorporated an integral roll bar and a well-padded dash and interior panels, more than five years before such padding would be mandated by federal law. Although the Avanti’s Lark-derived suspension was none too sophisticated, its handling was sharpened with heavy-duty springs and shocks, front and rear anti-roll bars, and auxiliary trailing links to help locate the live rear axle. The Avanti also had excellent brakes for its era. The rear brakes were oversize 11-inch (279mm) finned drums while the fronts were big 11.5-inch (292mm) Bendix discs — licensed versions of the Dunlop discs used by Jaguar. Discs were becoming common in Europe by that time, but they were still rare in the U.S.; the only previous American production car to use caliper discs had been the short-lived Crosley Hotshot. Sherwood Egbert originally wanted the car that became the Studebaker Avanti to be a two-seat coupe, but Loewy eventually convinced him it should be a four-seater instead. The Avanti’s basic concept (a four-seat sporty car using passenger-car mechanicals) and general size have since led it to be compared to the Ford Mustang and Chevrolet Camaro, with some historians proclaiming the Avanti the first “pony car.” The Avanti is slightly larger than an early Mustang or Camaro, but was priced far higher; an early 1965 Mustang started at $2,368, more than $1,100 less than a 1964 Avanti. A supercharged R2 Avanti was, however, a good performance match for a Mustang with the high-power K-code 289 cu. in. (4,728 cc) V8. In March 1962, Studebaker-Packard acquired Paxton Products and with it the services of Andy Granatelli, whom Egbert knew from McCulloch. Egbert ordered Granatelli to help Gene Hardig update Studebaker’s familiar 289 cu. in. (4,737 cc) V8, which dated back to 1951, in search of more power. The Studebaker V8 was not an outstanding engine, being overweight and prone to oil leaks, but Hardig gave it a thorough going-over. In basic R1 form, standard on the Avanti, the revamped V8 made 240 gross horsepower (179 kW). The optional R2 version added a Paxton supercharger, raising power to about 290 hp (216 kW), one gross horsepower per cubic inch (61 hp/liter). The Lark’s three-speed stick was the standard transmission, but most Avantis had either a four-speed manual (the ubiquitous Warner T-10) or a modified Borg-Warner three-speed automatic that Studebaker called Power-Shift. The Granatellis also developed hotter 304.5 cu. in. (4,991 cc) R3 and R4 versions (and an experimental R5) that produced as much as 335 gross horsepower (250 kW), but they were very rarely ordered. Studebaker built only nine R3 Avantis and no known R4s, although Granatelli later bought most of the remaining R3 engines, so some of them found their way into Avantis after the fact. Just as Egbert had demanded, Studebaker unveiled an early-production Avanti at the New York show in April 1962. However, production problems, chiefly with the fiberglass body, kept Avantis from showrooms until fairly late in the year. When the new car did finally go on sale, its list price was a substantial $4,445, equal to a Ford Thunderbird coupe, $112 more than Buick’s new Riviera, and $193 more than the dramatic new Corvette Sting Ray coupe. In short, the Avanti was very pricey, especially for a marque that was not exactly dripping with prestige. 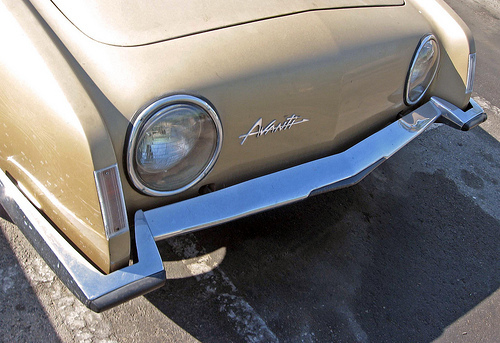 The Studebaker Avanti may have lacked badge cachet, but it didn’t lack for performance. With the R1 engine and automatic, the most common powertrain combination, it could go from 0-60 mph (0-97 km/h) in about 9.5 seconds, putting it on a par with the Thunderbird. The supercharged R2 was a different story. Capable of 0-60 mph (0-97 km/h) in about 7.5 seconds and a top speed of well over 120 mph (193 km/h), an R2 Avanti would outrun any pure-stock American car except the hottest Sting Rays and the new Shelby Cobra. The rare R3s were faster still. Eager to bolster that image, Studebaker dispatched Andy Granatelli to the Bonneville Salt Flats to set some records. In 1962, production Avantis set 29 speed records and a souped-up supercharged Avanti reached a top speed of 171 mph (276 km/h) at Bonneville. A year later, Egbert himself drove a modified, R3-powered Avanti to a flying-mile record of 168 mph (271 km/h). An experimental car with twin superchargers (dubbed Due Cento) reached a USAC-certified top speed of 196.62 mph (316.6 km/h). 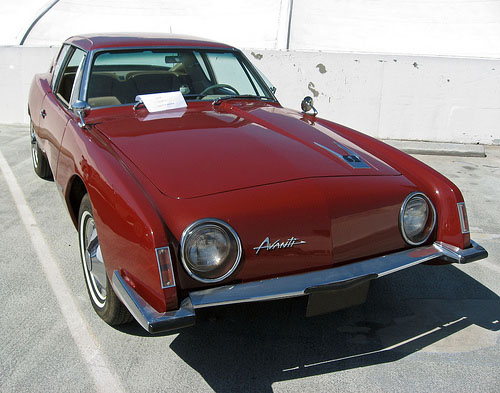 The asymmetric hood bulge was one of the Studebaker Avanti’s more curious styling features. 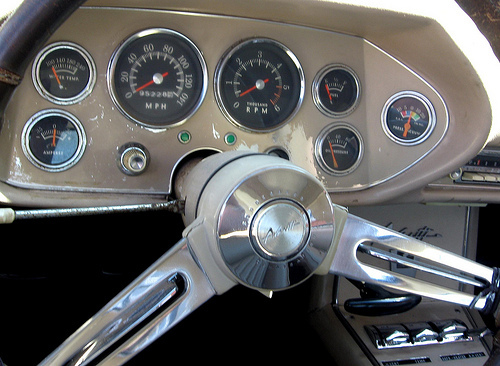 It continues the lines of the top part of the dashboard, centered on the steering column. Intended to evoke the feel of a fighter plane gunsight, it was a feature Loewy had previously incorporated on his Motto-bodied Lancia (one of the chief stylistic precursors of the Avanti), which was displayed at the Paris Salon in 1960. Most reviewers found the Studebaker Avanti’s acceleration and braking commendable, but were less impressed with its handling. The Avanti was a fairly bulky car by international standards, stretching a little over 192 inches (4,887 mm) on a 109-inch (2,769mm) wheelbase and tipping the scales at more than 3,700 pounds (1,715 kg) with automatic and air conditioning. Perhaps more significantly, the Avanti had inherited the Lark’s formidable front weight bias and antiquated front suspension, which compromised agility and resulted in vague steering feel. The stiff shocks and springs provided good body control, but they also contributed to a heavy-footed feel on broken pavement. By the standards of passenger cars of its era, the Avanti’s handling was above average, but it was definitely no match for a Corvette Sting Ray. Neither critics nor buyers were blown away by the Avanti’s unusual exterior styling, which was certainly distinctive, but a bit fussy. Critics liked the absence of chrome and glitter, but contemporary buyers were displeased by the grilleless nose, forward rake, and gimmicks like the asymmetric hood bulge. The interior was less controversial — offering bucket seats, full instrumentation (including a 6,000-rpm tachometer and even a vacuum gauge), a Thunderbird-style center console, and an aircraft-inspired overhead panel for the light switches — but potential buyers remained skeptical. 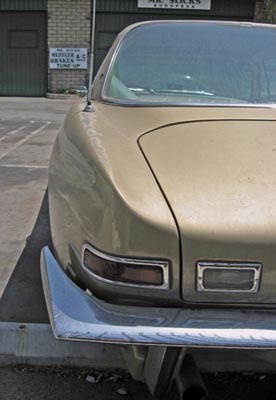 The Studebaker Avanti’s fender line forms an unbroken arc from the body side through the edge of the decklid, reflecting Loewy’s abhorrence of straight lines. The Avanti’s gently peaked rear fenders are reminiscent of the ones on the Volvo P1800 coupe, which appeared a few years earlier. However, the Avanti’s peaks are less sharp than the Volvo’s — a side effect of the Avanti’s fiberglass body, which allowed more complex curves than steel, but didn’t lend itself to hard edges. Perhaps the Avanti’s greatest sales obstacle was the general perception that Studebaker itself was being measured for a coffin. First-year production totaled a meager 3,834 units — not enough to worry the Corvette, let alone the Thunderbird. A modest facelift for 1964 changed the headlights and a few other details, but Avanti sales sank to a dire 809 units. By then, both Sherwood Egbert and Studebaker were terminal. Egbert’s apparent vitality belied the fact that he had recently been diagnosed with stomach cancer. He stayed at work as long as he could, but late that year, his health finally forced him to take an indefinite leave of absence. Egbert’s departure was the last straw for the Studebaker-Packard board, which on December 9 announced the closure of the South Bend factory. Production of the Lark would be continued for a time at Studebaker’s factory in Hamilton, Ontario, but the Avanti, the Hawk, and Studebaker’s truck line were canceled. So, too, were Studebaker’s existing engines; after the end of the 1964 model year, Studebakers would use engines purchased from Chevrolet. Studebaker continued its Canadian and overseas production for a few more years, finally closing in March 1966. Although the company was no longer in the auto business, the board’s insistence on diversification saved the Studebaker-Packard corporation as a whole, although it went through several subsequent mergers and name changes over the next few years. By then, Loewy and Granatelli had moved on to other things. Egbert never fully recovered and died in 1969. Studebaker Avantis last wore this badge in the 1964 model year. Later cars were badged Avanti II or simply Avanti. This ordinarily would be the end of the Avanti story — another entry in the lexicon of valiant but Pyrrhic lost causes — but what happened next was not quite so simple. On July 1, 1964, only a few months after the South Bend factory shut down, local Studebaker dealers Nathan Altman and Leo Newman signed an agreement to purchase the Avanti name, the rights to the design, all of the associated molds and tooling, and about 500,000 square feet (46,400 square meters) of the now-shuttered South Bend factory complex. Altman and Newman also hired Gene Hardig as chief engineering consultant, along with a number of other laid-off Studebaker employees. Their plan was to resume production of the Avanti as an exclusive, limited-edition luxury coupe. 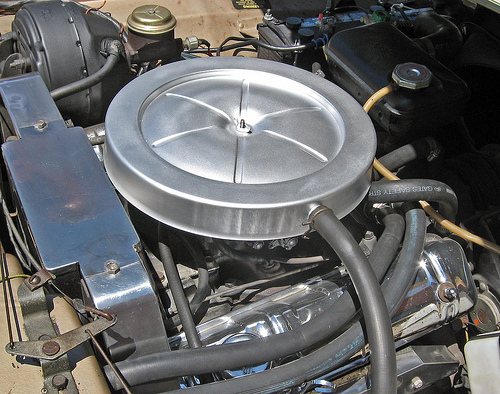 The standard R1 engine in a 1963 Studebaker Avanti. The Studebaker V8 bowed back in 1951, originally displacing 233 cu. in. (3,812 cc). The Avanti’s version was 289 cu. in. (4,737 cc); it has no relationship to the Ford V8 of the same approximate displacement. In standard form, the Avanti’s R1 engine had a single four-barrel carburetor and 10.25:1 compression, making 240 gross horsepower (179 kW). It’s a heavy engine and prone to oil leaks, but it’s durable and has strong low-end torque. Avanti IIs replaced it with a Chevrolet 327 cu. in. (5,354 cc) V8, rated 300 gross horsepower (224 kW). 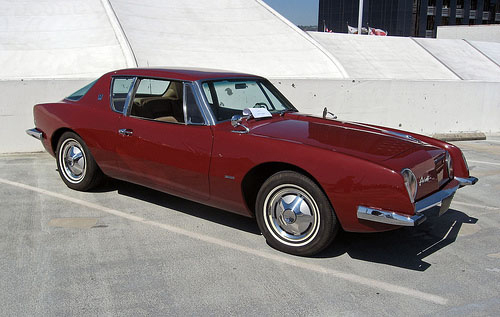 The Studebaker Avanti’s fiberglass body had enabled it to be rushed into production and problems with its construction had been responsible for many of the Avanti’s initial problems. Now, it would also prove to be the car’s salvation. Had the Avanti been bodied in steel, Altman could never have afforded to resume production, but in fiberglass, the new Avanti Motor Corporation could still conceivably make a profit on a small production run, particularly since their starting price was more than $2,000 higher than the original car’s. The revived Avanti, dubbed Avanti II, was altered very little, although Hardig eliminated the original car’s forward rake, which Avanti customers hadn’t liked. Many of the original components were retained, since they’d always been bought in rather than manufactured by Studebaker itself; the Lark frame was made by Budd, the brakes by Bendix, and the transmissions by Borg-Warner. The fiberglass body was again made by MFG. All the Altman-built Avantis wore Avanti II identification. Stephen Blake dropped the Roman numeral after acquiring the company in the early eighties. The Avanti’s original 289 cu. in. (4,737 cc) R1 and R2 engines were no longer readily available now that production had ended. Since Studebaker had already mated Chevrolet engines to the Lark chassis, Altman and Newman opted to do the same, although they selected the bigger Turbo-Fire 327 cu. in. (5,354 cc) rather than the 283 cu. in. (4,638 cc) engine used by Canadian-built Studebakers. The version used in the Avanti II was the high-compression four-barrel engine that was standard in contemporary Corvettes, making 300 gross horsepower (224 kW). It was a worthwhile swap; not only was the Corvette engine more powerful than even the supercharged R2, it weighed around 150 lb (68 kg) less, which significantly improved weight distribution (though not curb weight, which thanks to the extra equipment was a bit heavier than before). The Avanti II was very much a specialty item. With a starting price of more than $6,500, it cost fully $1,000 more than an E-type and considerably more than even a lavishly equipped Corvette. Exclusivity was a big part of the Avanti II sales pitch; Altman and Newman declared that production would be no more than 300 units a year, although as things turned out, they didn’t build their 300th car until 1969. Nonetheless, the Avanti II was in many ways the ultimate Avanti, with performance and handling superior to the original’s. Perhaps the highest compliment in that regard came from Loewy, who in 1972 bought an Avanti II for his own use. The Avanti II continued into the seventies, although federal regulations forced various minor design modifications. The most obvious — and aesthetically questionable — was the replacement for 1973 of the delicate flush bumpers with bulky new 5 mph (8 km/h) units; they were necessary to meet the latest bumper standards, but made the car look rather ungainly. Despite the extra weight, the Chevrolet 350 cu. in. (5,733 cc) engine, which had replaced the Turbo-Fire 327 in mid-1969, continued to provide decent performance, as did the slow-revving 400 cu. in. (6,470 cc) version, which became standard from 1972 to 1976. The four-speed manual, rarely ordered, was dropped in the early seventies and GM’s three-speed Turbo Hydra-Matic became standard, replacing the older Borg-Warner transmission. For 1981, the standard powertrain became Chevrolet’s 155 hp (116 kW) 305 cu. in. (4,999 cc) V8 mated to a new four-speed Turbo Hydra-Matic with very tall gearing, which provided better fuel economy at the expense of acceleration. The early Studebaker Avanti dressed up its interior with plush vinyl upholstery, bucket seats, full instrumentation, and an “aircraft-inspired” overhead console. Not only does it have a 6,000-rpm tachometer, oil pressure, ammeter, and coolant temperature gauges, the instrumentation even includes a manifold vacuum gauge, useful on the supercharged R2 cars. 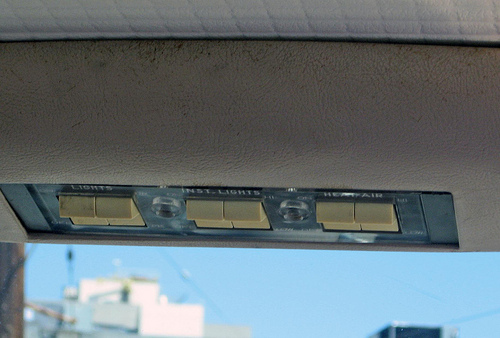 The overhead console has switches for the lights. After Nate Altman died in April 1976, control of Avanti passed to his brother Arnold. In October 1982, Arnold Altman reluctantly sold the company to Stephen H. Blake, a 39-year-old real estate broker and car collector from Washington, D.C., who had been trying to buy Avanti for almost six years. The deal cost Blake more than $4 million, but he estimated that the factory and tooling were worth over 10 times that amount, which made Avanti look like a highly worthwhile investment. Blake made a concerted effort to reorganize the factory, find new distribution outlets (since the Studebaker dealer network had folded, most Avanti IIs had been sold directly to customers), and update the car itself. For the 1984 model year, the Avanti (no longer called Avanti II) got a minor cosmetic makeover that included rectangular sealed-beam headlights, body-color Kevlar bumpers, and a revised interior; a limited-edition Touring Coupe model added blackout or body-color trim rather than chrome. The owner of this eighties Avanti identified it as a 1984 model, but we have no explanation for why it lacks the rectangular headlights adopted for 1984. Given the nature of Avanti production, there are various possible explanations. There were also some updates to the running gear, including Corvette-derived variable-ratio power steering and new front brakes from the Chevrolet Camaro Z28. 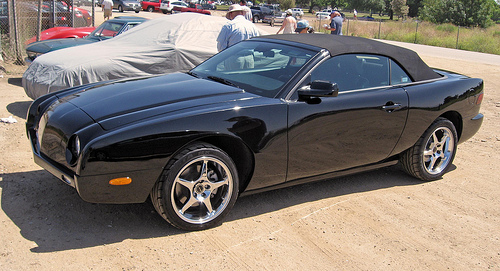 The Z28 also provided the Avanti’s newly optional high-output engine, which was still 305 cu. in. (4,999 cc), but now offered 190 hp (142 kW) and 0-60 mph (0-97 km/h) times in the mid 8-second range even with the lazy 2.87 axle ratio. All that was unfortunately reflected in the base price, which swelled from $24,995 to almost $32,000 — in the ballpark of a new Jaguar XJ-S.
Those changes represented only the first phase of Blake’s ambitions. For 1985, the H.O. engine would become standard and a new Avanti GT would offer a fuel-injected version of the same engine with a healthy 205 hp (153 kW). Blake promised that those would soon be followed by the return of the 350 cu. in. (5,733 cc) V8 and an available five-speed manual gearbox. He also hired former Pontiac engineer Herb Adams to develop a new chassis with fully independent suspension and showed off the prototype of a new Avanti convertible. These plans were very ambitious and soon left Blake overextended. Despite its modest sales volume, Avanti had been reasonably profitable and mostly debt-free before Blake’s arrival, but all this activity was a lot for a tiny company to take on. The last straw was when Blake tried to take the Avanti racing — always an expensive endeavor and more than his creditors were willing to support. In October 1985, Avanti filed for bankruptcy. Its assets were sold in 1986 to Michael Kelly, a Texas entrepreneur originally from Lakeville, Indiana, for about $725,000, less than one-fifth of what Blake had sunk into the company. Like Blake, Kelly had ambitious plans both for the Avanti, including not only new models, but also an aggressive cross-promotional campaign with brands like the Sheraton Hotels chain. He announced that Avanti would finally launch the planned convertible along with a stretched-wheelbase “Luxury Sports Coupe,” an even longer four-door, and a rather grotesque stretched limo. The previous high-output engines were dropped, although for 1988, Avanti offered a special Silver Anniversary model with a supercharged Chevrolet 305 intended to recall the old Paxton-supercharged Avanti R2. This is one of 38 completed 2007 Avantis. Under the fiberglass skin — restyled by Jim Bunting and Tom Kellogg, but looking more like the original than some of the latter-day Avantis — it’s essentially a re-bodied Ford Mustang and is registered as such. Although it looks big, it’s actually a little smaller than the original Studebaker Avanti, stretching 187.6 inches (4,765 mm) on a 107-inch (2,718mm) wheelbase. The factory didn’t quote a curb weight, although our guess would be in the neighborhood of 3,600 lb (1,633 kg) in convertible form. Avanti built 50 of the supercharged cars, but of the other new models, only the Luxury Sports Coupe and the convertible made it to production during Kelly’s tenure. Few were sold; the long-wheelbase coupe now started at almost $56,000, which was a lot to ask for an aging design that, while greatly improved in many mechanical respects, was beginning to look like a caricature of itself. In need of capital, Kelly sold part of the company to J.J. Cafaro, a commercial real estate developer from Ohio. In August 1988, Cafaro bought out Kelly’s share of the company, which was reorganized a third time. Although Blake and Kelly had both opted to keep production in South Bend — Blake had considered moving elsewhere, but decided the goodwill of the locals was an important asset — Cafaro shortly transferred the renamed Avanti Automotive Corporation to a new factory in Youngstown, Ohio. As was becoming an all-too-familiar pattern, Cafaro’s tenure was marked by boundless optimism, a brief burst of improved sales — 350 cars for 1990, a post-Studebaker record — and then a swift decent into bankruptcy. The Youngstown factory ceased operation in 1991. Although Raymond Loewy had died in 1986, the car he designed was not yet ready to follow him. In 1993, Avanti fan Jim Bunting commissioned Tom Kellogg, one of the Avanti’s original designers, to help Bunting design a two-seat version of the Avanti. Bunting and hot-rodder Bill Lang then built a prototype using a 1994 Pontiac Firebird, replacing the F-body’s plastic body panels with new fiberglass pieces. Bunting showed the finished car, which he dubbed AVX, at Studebaker and Avanti club meetings in 1996. In 1997, he incorporated a new company called AVX Cars, which he announced would partner with Lang Custom Auto to build and sell more AVXs, again based on fourth-generation F-body donors. AVX Cars built two more prototypes, but never went into production. Instead, Bunting sold the company in 1998 to John Hull and John Seaton. In mid-1999, they got a new partner: Michael Kelly, with whom they arranged to purchase the remaining assets of the old Avanti Automotive Corporation. They subsequently revived the Avanti Motor Corporation and announced that they would set up a new factory in Villa Rica, Georgia, to build the AVX under the Avanti name. Seaton departed in 2001, around the time the first of the new Avantis went on sale. Available in either coupe or convertible form, the cars were now essentially re-skinned Firebirds, sharing the F-body’s LS1 V8 engine and running gear. That at least provided ample performance, not to mention features that Avanti would probably have been unable to develop on its own (such as ABS), but with sticker prices starting at $79,000, the noveau Avanti also cost about twice as much as did the donor car. Nonetheless, Avanti sold 129 in the first two years, which was better than Altman and Newman had done at the outset. GM canceled the Firebird and Camaro in 2002, but with Avanti’s limited sales volume, the remaining stockpile of donor cars was enough to last through 2004. Total production of the F-body-based cars eventually came to 319 units. In 2003, Avanti faced an additional GM-related problem following the unveiling of a prototype of Avanti’s planned SUV, initially called Studebaker XUV and later renamed Avanti Studebaker. The prototype, which was shown at a number of U.S. auto shows, bore no resemblance to either the AVX or earlier Avantis, but it did look a great deal like a HUMMER H2, which prompted a legal battle with GM that was finally settled that August. Avanti announced that it would build the SUV using Ford Super-Duty truck chassis and engines, but it never happened. Like the Ford Mustang on which it’s based, the modern Avanti still has a live rear axle, now located with three trailing links and a Panhard rod. Although the modern Avanti was assembled by hand at considerable expense, build quality was hit and miss; this car reportedly suffers an assortment of squeaks and rattles as well as several misaligned body panels. Its kinship with the Mustang does at least provide it with airbags and anti-lock brakes. In late 2004, Kelly announced that he would sell Avanti and retire. The sale plans ultimately fell through, so he ordered the AVX re-engineered to use the new S197 Ford Mustang platform and arranged to purchase Ford engines and transmissions to replace the previous GM powertrains. The first of the Mustang-based Avantis, initially offered only in convertible form with Ford’s 281 cu. in. (4,601 cc) OHC V8, arrived in 2005. That fall, Kelly’s father Leonard, who had replaced him as Avanti’s president, announced the addition of a coupe and a choice of V8 or 244 cu. in. (3,996 cc) V6 engines. As usual, there were promises of new distribution efforts, additional features, and performance upgrades including an optional supercharger. In October 2006, Avanti production moved from Georgia to a new plant in Cancún, Mexico, under the leadership of new president David Sharples, formerly of MG Rover. Less than two months later, on December 22, FBI agents arrested Michael Kelly in Jacksonville, Florida. He was subsequently charged with 14 counts of fraud in connection with what the U.S. Attorney’s Office alleged was a $340 million Ponzi scheme to defraud investors in Mexican time-share properties. Sharples told the press that Kelly was no longer part of Avanti and that Kelly’s arrest would not affect the company’s plans, but production ended in March after about 38 2007 cars had been built. In September 2007, the Securities and Exchange Commission named the Avanti Motor Corporation as a relief defendant in the complaint against Kelly, alleging that Avanti had received illegal proceeds from the fraud. As of this writing, the company website indicates that Avanti has shut its doors for good; we don’t know what became of its physical assets or the handful of incomplete cars that reportedly remained when production shut down. Kelly spent much of the next five years in a federal correctional facility, finally coming to trial in 2012. He pleaded guilty to one of the fraud counts and was released on bail while awaiting trial on the remaining charges. Most of his assets — reportedly including the Avanti Motor Corporation’s trademarks and other intellectual property — were liquidated in the interests of repaying the various victims of the Ponzi scheme. Kelly, now in poor health, remained out of jail and at home until late the following year. He died on December 22, 2013, seven years after his original arrest. Although the modern Avantis are really kit cars — depending on the donor model, most states register them as either Pontiacs or Fords, not as Avantis — that isn’t so far removed from the original car as it might seem. It wouldn’t be entirely fair to characterize the Avanti as just a Lark in fancy dress, but at the same time, the avant-garde styling, flashy interior (to our way of thinking the original car’s most appealing feature), and extra features could not wholly disguise the mundane passenger car underpinnings. Admittedly, one could make similar statements about the early Ford Mustang or Chevrolet Camaro (which critics like Road & Track did at the time), but the Lark platform had been dated even by the standards of the early sixties, which didn’t help its case. The philosophical question that always plagues kit cars — or cars accused, fairly or not, of being glorified kits cars — is whether they have an identity of their own that transcends the sum of their various donated parts. Whatever one thinks of the Avanti from an aesthetic or technical perspective, it would be hard to deny that it has always been an idea more than a car: Sherwood Egbert’s hopes of saving Studebaker; Raymond Loewy’s aesthetic vision; Nate Altman’s dreams of making a bespoke American GT; Stephen Blake and Michael Kelly’s various ambitions for reinventing the Avanti for the eighties and beyond; the list goes on. The scope and direction of those visions have shifted and evolved over the years, but their power has never really diminished. There’s always been a bull market for dreams. The new Avanti still wears the same badge as its predecessor of 45 years earlier. As of this writing, the Avanti appears to finally be dead, but that’s been said before. Considering its history, we wouldn’t be at all surprised if a design that has flirted with the Grim Reaper more often than Harry Houdini had at least one more miraculous escape up its sleeve. Our sources included the Auto Editors of Consumer Guide, Encyclopedia of American Cars: Over 65 Years of Automotive History (Lincolnwood, IL: Publications International, 1996); J.L. Beardsley, “Ancestors of the Avanti,” Car Life Vol. 10, No. 5 (June 1963), pp. 34–37; Patrick Bedard, “Retrospective: Studebaker Avanti: If not ahead of its time, then certainly contrary to it,” Car and Driver Vol. 39, No. 10 (April 1994), pp. 124-127; John R. Bond, “A Plan for the Future,” Car Life Vol. 10, No. 5 (June 1963), pp. 28–33; Arch Brown, “Another Visit with George Romney,” Special Interest Autos #77 (September-October 1983), reprinted in The Hemmings Motor News Book of Hudsons: driveReports from Hemmings Special Interest Autos magazine, ed. Terry Ehrich and Richard Lentinello (Bennington, VT: Hemmings Motor News, 2001), p. 96, and and “Why Studebaker-Packard Never Merged With AMC and other revelations by Governor George Romney,” Special Interest Autos #66 (December 1981), pp. 50-55; Arch Brown, Richard Langworth, and the Auto Editors of Consumer Guide, Great Cars of the 20th Century (Lincolnwood, IL: Publications International, Ltd., 1998); David R. Crippen, “The Reminiscences of Robert F. Andrews” [interview], 2 August 1985, Automotive Design Oral History Project, Accession 1673, Benson Ford Research Center, www.autolife.umd. umich.edu/ Design/Andrews_interview.htm [transcript], accessed 9 June 2008; J.T. Crow, “Avanti Record Run,” Car Life Vol. 9, No. 10 (November 1962), p. 68; Pat Foster, “History of Automotive Design 1961: Designing the Fabulous Avanti,” Hemmings Classic Car #16 (January 2006), pp. 64–69; Fred Fox, “Six Week Wonder: 1963 Studebaker Avanti,” Special Interest Autos #32 (January-February 1976), reprinted in The Hemmings Book of Postwar American Independents: driveReports from Special Interest Autos magazine, ed. Richard A. Lentinello (Bennington, VT: Hemmings Motor News, 2002), pp. 90-95, and “Studebaker R3 Avanti: America’s Fastest Car?” Special Interest Autos #96 (November-December 1986), reprinted in The Hemmings Motor News Book of Studebakers: driveReports from Special Interest Autos magazine, eds. Terry Ehrich and Richard Lentinello (Bennington, VT: Hemmings Motor News, 2000), pp. 110-117; Richard Gallatin’s Avanti website (www.theavanti.net, accessed 9 June 2008); Nick Georgano and Nicky Wright, Art of the American Automobile: The Greatest Stylists and Their Work (New York: SMITHMARK Publishers, 1995); Ken Gross, “1960 Lark Convertible: How Studebaker beat the Big Three to the compact punch,” Special Interest Autos #42 (November-December 1977), reprinted in ibid, pp. 90-97; John Gunnell, ed., Standard Catalog of American Cars 1946-1975, rev. 4th ed. (Iola, WI: Krause Publications, 2002); Dave Holls and Michael Lamm, A Century of Automotive Style: 100 Years of American Car Design (Stockton, CA: Lamm-Morada Publishing Co. Inc., 1997), pp. 214-216; Bob Johnstone, Bob’s Studebaker Resource and Information Portal, www.studebaker-info. org, accessed 16 March 2010; Donald L. Jones, “Avanti Garde: Experimental Studebakers,” Olds Cars Weekly June 2010, and “The Avanti Story,” Avanti Owners Association Internationl, Inc., 27 August 2013, www.aoai. org/the_avanti_story.php, accessed 5 September 2015; Mark J. McCourt, “Collector Buyer’s Guide: 1963–1964 Studebaker Avanti,” Hemmings Classic Car #59 (August 2009), pp. 74–Bob McVay, “Avanti,” and “Studebaker (Canada),” Motor Trend Vol. 18, No. 1 (January 1966), p. 38; Jim Moody, The McCulloch Supercharger Website, 5 October 2006, www.vs57. com, accessed 30 August 2009; Chuck Nerpel, “Avanti,” Motor Trend Vol. 14, No. 7 (July 1962); David H. Ross, “Avanti: the 40-day design,” Car Life Vol. 14, No. 7 (August 1967), pp. 50–53; “Salt-Seasoned for ’64,” Car Life Vol. 10, No. 11 (December 1963), pp. 20–22; Brooks Stevens, “How I made a few improvements to the Starliner and created the Gran Turismo Hawk,” Special Interest Autos #25 (November-December 1974), reprinted in The Hemmings Motor News Book of Studebakers, pp. 82-83; Daniel Strohl, “1956 Parklane Performer” and “McCulloch supercharger history,” Hemmings Classic Car #16 (January 2006), p. 20–27; “Studebaker Avanti: It’s only a Lark in a gilded cage to some, while to others it is the newest, freshest design to come from a U.S. builder since the supercharged Cord 812,” Road & Track Vol. 14, No. 2 (October 1962), pp. 30-33; “Studebaker — How Far Forward? !” Car Life Vol. 10, No. 5 (June 1963), pp. 12–19; Rich Taylor, “Variations on a Soaring Theme” and “How Studebaker Came Not to Be,” Special Interest Autos #25 (November-December 1974), reprinted in The Hemmings Motor News Book of Studebakers, pp. 72-75 and 78-79; and James Arthur Ward, The Fall of the Packard Motor Car Company (Stanford, CA: Stanford University Press, 1995). Some information on Raymond Loewy came from the Official Site of Raymond Loewy (Laurence Loewy, n.d., www.raymondloewy.com, accessed 9 June 2008) and “Modern Living: Up from the Egg,” TIME 31 October 1949, www.time. com, accessed 9 June 2008. 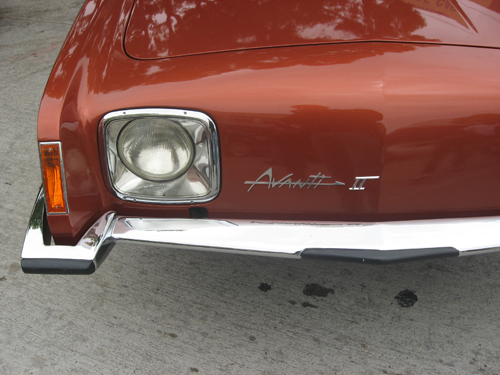 Additional information on the Avanti II came from the Auto Editors of Consumer Guide, “1965, 1966, 1967, 1968, 1969 Avanti II,” HowStuffWorks.com, 25 November 2007, auto.howstuffworks. com/ 1965-1969-avanti-ii1.htm, accessed 10 June 2008, and “How Avanti Cars Work,” HowStuffWorks.com, 13 June 2007, auto.howstuffworks. com/avanti-cars.htm, accessed 9 June 2008; the Avanti Motors company website (Avanti Motors, last updated 27 October 2006, www.avantimotors.com, accessed 10 June 2008); Avanti Motor Corporation, “2006 Is Bright for Avanti, Avanti Motor Corporation Announces Redefined Care Models for 2006” [press release], 3 October 2005; “Avanti II,” Road & Track August 1966; Matthew Chess, Avanti Source Home Page, 1999-2008, avantisource. com [no longer active], accessed 9 June 2008; Lindsay Chappell, “Avanti Arrest,” Automotive News 30 January 2007, www.autonews. com, accessed 9 June 2008; John Dinkel, “Avanti II,” Road & Track March 1984, pp. 12–13; “Avanti II,” Road & Track June 1984; Mark Frankel, “‘I liked the car so much I bought the company,’ Regardies March 1983, pp. 58–68; “GM and Avanti Settle Dispute – Studebaker XUV Will Go Into Production Soon,” The Auto Channel, 8 August 2003, www.theautochannel. com, accessed 9 June 2008; Tudor Van Hampton, “Distinctive Studebaker Avanti is once again up for sale,” The Seattle Times, NWautos, 2 September 2012, blog.nwautos. com, accessed 5 September 2015; Jason Meisner, “Fraud victims upset by 7-year effort to repay them after Michael Kelly’s Scam,” Chicago Tribune 23 October 2013, articles.chicagotribune. com, accessed 5 December 2015; “Michael Eugene Kelly – Passes – Sunday December 22, 2013,” The Studebaker Drivers Club Forum, 22 December 2013, forum.studebakerdriversclub. com/ showthread.php? 77618-Michael-Eugene-Kelly-Passes-Sunday-December-22-2013, accessed 5 September 2015; Naomi Nix, “Swindler gets 5-year prison sentence for $340 million scheme,” Chicago Tribune 13 December 2012, articles.chicagotribune. com, accessed 5 September 2015; Dan Roth, “Curses! Avanti’s planned comeback may be foiled,” Autoblog, 5 February 2007, www.autoblog. com, accessed 9 June 2008; Marshall Shuon, “About Cars; 1989 Avanti Catches Your Eye,” New York Times 23 April 1989, www.nytime. com, accessed 9 June 2008; Leslie Clark Stipek, “About Michael Eugene Kelly,” 9 May 2008, www.lesliestipek. com/ michaelekelly.asp, accessed 9 June 2008; U.S. Securities and Exchange Commission, “Litigation Release No. 20267: SEC v. Michael E. Kelly, et al., (USDC N.D. Ill., Civil Action Number 07 C 4979, filed September 5, 2007): SEC Charges Twenty-Six Defendants in a $428 Million Securities Fraud That Targeted Senior Citizens and Retirement Savings, 5 September 2007, www.sec. gov/ litigation/ litreleases/2007/ lr20267.htm, accessed 5 September 2015; Peter Valdes-Dapena, “Avanti Car Company for Sale,” CNN/Money, 18 August 2004, money.cnn. com, accessed 9 June 2008; Tudor Van Hampton, “Collectible Cars: From Savior to Orphan,” New York Times 17 June 2012, www.nytimes. com, accessed 5 September 2015; Frank Washington, “Buffing Up an Old Classic: Avanti drives again,” Newsweek 3 April 1989, p. 46; and Yes Virginia There is a 2006 Avanti,” The Auto Channel, 6 October 2005, www.theautochannel. com, accessed 5 September 2015. We also consulted the following period road tests: “Avanti: A Stunning New Studebaker,” Car Life Vol. 9, No. 6 (July 1962); “First 1963 Road Test! Studebaker Avanti,” Motor Trend Vol. 14, No. 7 (July 1962); “Studebaker’s New Avanti”, Road & Track Vol. 14, No. 2 (October 1962); “Avanti: A Step Forward by Studebaker,” Hot Rod June 1963; “New Avanti II Road Test,” Auto Topics 1966; “Avanti II,” Road & Track 1966; “Timeless Beauty,” Car Life 1969; Bob Dinkel, and “Avanti II,” Road & Track 1984, most of which are reprinted in Avanti 1962-1991 Limited Edition Extra, ed. R.M. Clarke (Cobham, England: Brooklands Books Ltd., ca. 2003). I recalled in the early 1980s that Raymond Loewy had offered to design the Avanti replacement. However, Michael Kelly declined due to the limited funding. Whether Raymond Loewy had sketched the next generation Avanti or not, this remains mystery. The Avanti was one of the models that got me interested in Studebaker. 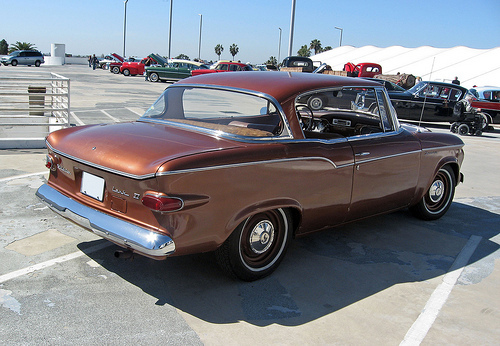 It is a timeless shape that happened to use Studebaker under pinnings – virtually anyone’s would have done. For a 49 year old “shape” it still looks fresh today. I would like to have an original super-charged model! Doing some research on the history of the Avanti, and while there’s plenty of info on the web, much of it is confusing and sketchy, particularly in regards to post-1987 history. This is best and most comprehensive story about this car I’ve found online. Job very well done. A very good overview –Thank you. Well, I think the comparisons between the Mustang and the Avanti are more conceptual: both were based on mundane compact cars (although obviously the Lark was itself a scaled-down descendant of Studebaker’s 1953 platform), with new styling and a sporty image. That was the basic formula for all of the pony cars (and, I’d argue, non-U.S. pseudo-pony cars like the Ford Capri and Toyota Celica). Where I think the comparison falls down is less on mechanical or production details than on price. The Avanti was a lot more expensive than the Mustang — even adjusting for the equipment that was standard on the Studebaker and optional on the Ford, the spread was more than $1,000, which was an enormous gap at that point. The Avanti wasn’t priced like a pony car, it was priced like a specialty car, in the same realm as a Corvette, Riviera, or Thunderbird. In the lexicon of the time, both the Avanti and Mustang were specialty cars, as were the Corvette, the Thunderbird, and the Riviera. The distinguishing factor of a specialty car in that sense was that it had its own body shell rather than being simply a different body style (e.g., the Riviera was a specialty car, but the Tempest GTO was not). If you prefer, a more apt comparison might be the original Thunderbird. The Avanti’s interior treatment — in some respects the early car’s most appealing feature — was more Thunderbird than Mustang. There’s probably a case to be made that the Avanti is sort of like what the Thunderbird might have become if the four-seat ‘bird hadn’t veered quite so hard in the luxury-and-gimmicks direction. I don’t think Studebaker could have profitably sold the Avanti for $1,000 less and even if they had, it wouldn’t have sold in anything like Mustang numbers. (I could see maybe 15,000 or so a year.) Aside from the price, the Avanti was hamstrung by the public recognition that Studebaker was on its way out and the fact that the car wasn’t really merchandized in a viable way. Egbert wanted the Avanti to be a showroom draw and a source of publicity, so I don’t think anyone really sat down and said, “Okay, how do we need to position and market this car to really sell it on its own terms? Who is going to buy it?” Admittedly, selling the Avanti in big numbers wasn’t the original goal, but it was a sharp contrast with Ford’s approach to the Thunderbird or Mustang. So, the Avanti both was and was not like the Mustang. I wasn’t implying that anyone was likely to cross-shop the two — the prices would have precluded that in any case — but there is nonetheless a worthwhile comparison to be made. I was in high school when I saw my first Studebaker Avanti. It was at the Studebaker dealer in Battle Creek. It was white, it had the R-2 engine with disk brakes and the floor shift automatic transmission. I don’t remember what the price was but I do remember I walked across the street to the Chevy dealer and looked at the blue Corvette on display. That Corvette which had a 5 inch crack in the right hand roof panel, was slower then the Avanti and was priced , $900.00 more then the Avanti. The GM story is just that a story…..far from the truth. The car did not have the luxury of a long gestation period, and as such was designed and rushed into production in under one year. Bodies were not jigged properly, and the body parts were not allowed to cure properly. Studebaker set up a second body plant in South Bend, hoping that two facilities would get production up and running smoothly…….indeed even Robert Morrison president of MFG stated he rushed the car into production when he should have known better….. The Avanti Owners Association International will be in South Bend, Indiana for the 50th anniversary Meet on July 29-August 4, 2012. We expect over 100 Avantis, all colors, models, engines, etc. This will probably be the only place to see this many cars in one place. The new Studebaker National Museum is open and is a wonderful place to visit. Voyez les articles historiques en France avec interview de Raymond Loewy dans la revue “Le Fanatique de l’automobile (années 1980). Auteur Michel Renou. I have to laugh when I read that an Avanti is a Lark in a gilded cage. This is like saying a Mustang is a Falcon in a gilded cage. People have always been snarky about the Avanti. It is a car that defies death, defies the negative, it lives – even now during this period of downtime. Don’t count this make out, it will likely return. Some Studebaker fans want to keep the make a dead make, so they can claim it only for themselves. Selfish and ignorant! Avanti will return, like it or not, love it or hate it. Those of us who love it will embrace it, the haters can slither off under their rocks, who cares what they think? When I was a child one of the church members drove his 1948 Studebaker Champion. In the late ’50s it had 3 of the original tires, all cracked and hard as rock. I especially liked the ’53-’54 Studes. They were my favorite car until is saw a 1:43 Corgi Citroën DS19! Which I still have! My father at age 19 went to South America in 1928 as a crewman of the SS Steel Inventor, a United States Steel ore ship, carrying a load of Erskines. My father and mother are buried in the same curbed area as Albert Russel Erskine, long-time president of Studebaker. A friend who had me repairing her Citroën ID19 borrowed an Avanti II from a friend and drove up to me. I seem to be attracted to cars that have a minimal to no grille. My Citroën SM had its grille tucked under the bumper. Other than styling, there isn’t really much reason for grilles on most modern cars. The high-pressure area under the bumper is more efficient and airflow through the grille can be detrimental to aerodynamics. In that respect, the Citroëns and Avantis were certainly ahead of their time. Before Mr. Bunting got hold of Tom Kellogg and put his design into production he built a two seater chop job out of an early Avanti. That put wheelbase at around 102 inches. like the 1997 Aston Martin DB7. However, in 1991 he put another important Avanti designer, Bob Doehler of Milwaukee to the task of drawing up such a car. No panels would have been shared, but all themes were respected. The car had an elliptical side window and deeper sloped windshield like the later Jag and Aston twins which it quite accurately predicted. The nose used two pairs of Integra round lamps, inners and outers. It was drawn up as a 100 inch wheelbase two seater. The tail was nearly indistinguishable from the original tail lamp and decklid groupings and rear bumper was as original. Grant Larson of Porsche was helpful to Bob in producing isometric views of the design and might have some available for your perusal. Before Mike Kelly’s past caught up with him he made some legitimate use in Billerica Georgia of the work of the well known Porsche specialist, named Beck, on a Lister Jaguar inspired C5 Corvette. I believe he considered marketing it. Similarly there was at some point an alleged tentative connection through the VW based Brazilian Puma, which was later involved I think in either commissioning or perhaps assembling some one of the three Porsche replica models that Mr. Beck has long been known for. Beck Porsche Spyders are not exacty kit cars, since they are highly refined and well crafted “rollers” lacking only power units etc. I offer this ony as hearsay, having chatted with Mr. Beck only twice. I am sure he would not like to remember any contacts with the aforesaid Mr. Kelly, a person I myself mistrusted the first time I met him. I, for one, have always wanted to see the original Avanti replicated with a Titanium/Aluminum alloy “X” frame (the original Lark Convertible unit.) It woud have a body fabricated entirely of Carbon Fiber while the remaining original metal parts (“Hog Trough” and all) manufactured from a Titanium/aluminum alloy as well. Thr remainder of the veicle would have four wheel disc brakes and would be powered by a 7.0 liter (427 cu. in.) 2013 Chevrolet Corvette drive train. This would make the Avanti the most powerful and agile American Grand Touring car extant. Great article Aaron – very informative, keep it up. What a fantastic looking car! I always really liked these machines when I was a kid & saw them in overseas car mags. You are right in that they are very comparable to the Mustang, as one of the very few american cars that have good balance & proportion without the usual chrome/wood-grain pretention. Way way ahead of anyone else including their target market @ the time. It was such a pity that they were totally “under-engineered” for volume production as they would have been a great muscle car in the Trans-Am champs with racing wheels, large exhausts, graphics etc. – if only. Loewy also had a hand in the late fifty’s English Audax design Hillman Minx -you can see the similarity to the early fifty’s Commander Studebaker. A very prolific & successful design consultancy. My dad had a Studebaker in the 50s and it was ahead of its time with hill holder and clutchless shifting. Everyone else had Fords and Chevy in the block. We were elite. I stand by the aforementioned idea, save for the possibility of using a 6.2 Liter supercharged Cadillac engine, transmisson and drivetrain from a 2016 Cadillac CTS-V sedan. With an independent rear suspension, such an Avanti would be the most impressive ever concieved and built. As a phoenix risen from the ashes, such an automobile would have no peer. I have recently acquired No.11 of the 1988 silver anniversary, LSC. Please help me with some basic information as to the underpinnings, The car is the victim of several years of neglect – open or leaky sunroof – etc. I have gotten the car running and driving but the digital instruments are acting weird and the interior needs a full redo. It has the supercharger but it was not belted when we got it and I have not tried to hook it up. If snyone can help with information or has interest in this vehicle please contact me at samtuckerlaw (at) gmail (dot) com. I redacted your phone number — if you really want to include it, let me know and I’ll put it back, but I can’t take any responsibility for the results if you want to publish it. (I figure most people get enough junk mail without inviting more robo-callers.) I’m afraid I can’t help you with repairs or restoration (I’m really not qualified for that), but I’ll leave your message here in case anyone else has anything to suggest. I was employed at Avanti Motor Corp. in the R&D department from the beginning until the end here in Youngstown Ohio, 1987 to 1991. As far as I can remember, by 1988, we were assembling the cars on Chevy Caprice chassis. I hope this helps. I worked with Nigel Gledhill, our chief engineer, for two years and we had designed and tried to get the Cafaros to build, a two seater hatchback or a smaller sportster with a removable hard top. No go, because they wanted to build that 4-door. We developed that 4-door in nine months, pulling 18 hour shifts. We also combined over 100 parts into the first one-piece floor pan. I did find out that the new company in Cancun eventually built a hatchback with removable hard top in 2001. I would love to see someone buy the rights and open up again. Even though I am close to retirement, I would definitely like to work on that car again! Captain–do I have the car for you, a very rare 1964 Avanti that you can customize and drop in that 6.2 L Caddy engine. Do and IRS and even a R & P front suspension. Arron has my contact information just ask him for it. You may not want the factory 289 but this entire car has less than 30,000 miles. My great grandfather worked for. Studebaker from the time they were making wooden wagons until the he retired in 1953.I would like to see Studebaker return to south bend,Ind. Many inaccuracies in this story. 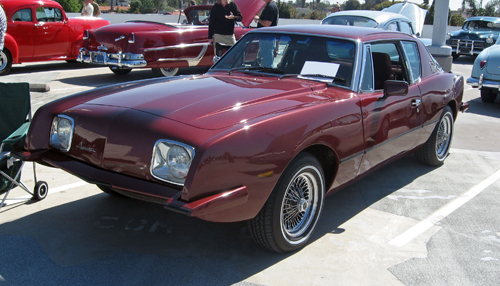 The maroon Avanti is a II with painted bumpers, not a Blake. The first Kelly cars were Monte Carlo’s or Impala’s with Avanti bodies bolted on. Blake filed bankruptcy due to switching paint and fiberglass formulas. The entire line of car’s paint peeled and warranty work killed them. As the caption for that photo notes, the identification of the later maroon car is questionable — the 1984 model year is simply what the owner indicated on the information card for the show. I didn’t get to talk to the owner about it, so I don’t know what the deal may have been. So, there may be an error there, but it’s not mine. For Studebaker timing meant a lot, the 59 and 60 Studebaker Larks brought back the company’s credability, 61 was flat and 62 with the GT Hawk, and restyled Lark, set the on the right path. If the had brought in the restyled 64’s in 63 and a restyled GT hawk in 64 they might have done better. But in the long run their days were numbered with the Japanese car companies taking a lot of market share.Plain fact is the just didn’t sell enough cars to keep the doors open, no different than any other company that closed down, the move to Canada was just an orderly liquidation. The real shame is the Studebaker-Packard company was one we couldn’t afford to lose,especially on the Packard side a few years before. But it was a window to the future to manufacturing in this country, but Studebaker car will be around for a long while, there are lots of them, plenty of parts and on the cheaper side of auto collecting. This story was well ddone, and a good window into the company’s story. You are right about the orderly liquidation. The corporate board had planned on eliminating auto production for years. That’s the reason the hired Sherwood. He had no auto experience and they had planned on blaming him for the close. He walked around the factory and talked to the workers and found out some of the Studebaker history and how many of the worker’s parents had worked for Studebaker. In the last two years of production in Canada, which by the way were profitable they had designed a sub-compact car that would have competed well with the small imports. One must keep in mind that the DeLorean DMC-12 is being built in the numbers of less than 350 per year. Resurrecting the old frame with modern materials isn’t inconceivable. A target of 300 units with an magnesium engine cradle and an alloy New Ford Mustang frame could keep the fabrication costs viable. A new 3.0 Liter Cadillac V-6 Twin Turbo engine, or a 5 Liter V-8 (made by GM built along the same lines as their 3.5 Liter V-6 with two more cylinders with greater displacement and higher compression). If you have an aluminum block and great cylinder sleeves, you can attain high durability while saving weight. Modern construction could make the Avanti a Personal Luxury Car worth owning. These are ideas that are worth considering. Many things are possible if you throw enough money at them, although given the preponderance of unitized construction and the modern regulatory climate, it seems like you’d mostly end up with a very expensive modern car that looks sort of like an Avanti. (I’ve never looked closely enough into the modern DMC-12 to discern how they’re squaring things with the NHTSA.) Whether that would be worthwhile is of course a matter of personal taste. I am someone who has grown up with Studes and their stories – I have an early Avanti (car #80) R2 – owned about 27years – it is an exact clone of the maroon one you have pictured in your article, but it was originally painted gold. I have read a lot of articles on the subject over the years – yours is very well done and quite accurate. They are unique cars. My car has been off the road for quite a while now, due to raising kids – but when I used to drive it regularly, it was a surprisingly functional car – drove quite well despite really bad gas mileage due to blower. I always thought it had a good balance between handling and dealing with less than perfect pavement conditions. I always loved when people would try to guess what it is. There were lots of cars in the 60’s and 70’s that were similar in concept(albeit more expensive), but far better cars in the main than the Avanti, and they have all disappeared-Jensen, Monteverdi, Bristol, Iso, De Tomaso etc, so why even dream of reviving a marque what was terribly outdated when it finally died. I think what it comes down to is that Avanti became more a shape than a marque. The final version wasn’t all that terribly outdated because it was for all intents and purposes a V-8 Mustang made over to look like an Avanti. In that light, I’m inclined to see it as somewhere between the “captive customs” some automakers used to offer (catalogued special bodies notionally built by some prestige coachbuilder) and the wraps some people put on their cars now. Saw an Avanti a few days ago that liked factory fresh. It still looks modern and different.. Same way a Citroen does. Thanks for publishing this entertaining update. I built an Avanti model kit when I was a kid in the early Sixties. It was one of my favorites. I was looking at the more recent ’63 model kit, and noticed it comes with a twin-supercharger option. Looking for more info, a search brought me here. Wondering if that setup in the kit is faithful to one of the “experimental” versions, and if so which one? Weird question, I know, but hey, this whole thing seems well past weird lol. This post is like self-satire. The experimental R5 engine had dual superchargers (Paxton, naturally) and fuel injection, so that’s what your kit was likely replicating. R5 engines were used for record-setting runs, so they got some publicity, but they were not even close to being offered for production. Excellent article which tells the whole story pretty well. 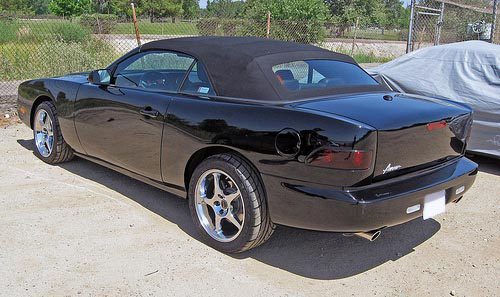 I own a 2003 Avanti convertible and can tell you that it turns heads and draws plenty of very favorable comments. Mine is 2002 Firebird chassis and therefore serving is simple in any GM shop once you let the service manager get your vin#. IT MAY NOT BE DEAD AFTER ALL. THEIR SITE IS TEASING AN ALL ELECTRIC MODEL.